The title of this book immediately caught my eye as a Farmer’s Wife, and a quilter! I was quite excited when I contacted Laurie with an offer to review a copy of her latest book. The book surpassed what I even imagined it would be like. My all-time favorite quilting book!! And quite possibly my favorite book reviewed this year! 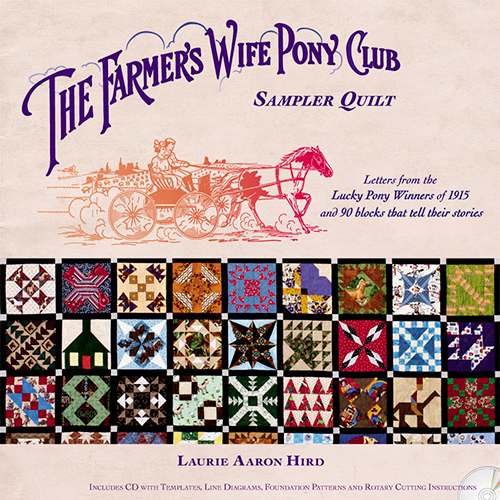 The combination of the letters from the Lucky Pony Winners of 1915 sponsored by Webb Publishing company, and fantastic quilt block designs for each letter, the book spotlights 90 beautiful blocks to be put into a sampler. Original concept, fantastic photos, brilliant historical recollections, and absolutely beautiful quilt blocks. One of the plusses of this book is that regardless of your type of quilting; using templates, foundation piecing, or rotary cutting, the directions are written for each. A CD is included with the book that provides cutting instructions for each block and the assembly diagrams. This book can easily be used by a beginner through advanced quilter and the options for color design, or placement are endless for your finished quilt. The history alone from these Pony Winning kids, born in the early 1900’s and the photos along with many of the letters makes this a fantastic read even for those who don’t personally quilt. A MUST for anyone you know who quilts, or loves to look at quilting books. Laurie has outdone herself in this book, and to think she did it all with young ones still at her side, and a home to take care of. I can’t say enough about the historical aspect of the book, and the merging with the design of the quilt blocks to represent each letter. I so would have loved to sit down with Laurie and interview her over a cup of tea (definitely not coffee as you will read later) but we live too many states from one another so I had to settle with an email interview. If I can choose one person I would love to meet, I think it would be Laurie!! I hope you agree after this review! You said you are a self-taught quilter. What age did you start learning to quilt, and what was your motivation to learn on your own? I was about 40 years old when I made my first simple quilt. (I'm 55 now.) Desperation was my motivation for learning to quilt on my own! For years and years I had wanted to take a quilting class, but with nine children at the time, and almost always a nursing baby, I could never leave my family long enough for such a luxury. Where has most of your collection of The Farmer's Wife magazines come from? My entire collection of magazines has been purchased from Ebay. Do you find there is still advice in the magazine that applies to farmer's wives today? The advice that sticks out most in my mind is to take every opportunity to enjoy the beauties of nature in God's world. How do you find time to quilt and write with your busy household? We only have the younger “half” of our eleven children at home now. The youngest is 10 years old, so I am not up all night with babies anymore. It is amazing what one can accomplish with the luxury of having a full night's rest! In my younger days, I used to think that there were really “super moms” but I no longer believe that to be true. Each woman simply trades one thing for something else. For an example, I have traded free time (I have very little), home baked goods (three daughters have taken over that job) and clean closets (they are not pretty, trust me!) for time to work on the books. My sewing time is in the evenings in the living room with my family. If I had to go into a separate room to sew, I never would complete a quilt. Do you homeschool your children and if so what bent of curriculum do you lean towards? I would call our homeschooling bent “traditional.” Our curriculum consists mostly of Rod & Staff, Christian Liberty, and ABeka books. We began homeschooling in 1983, when nearly all curriculum companies would only sell their books to traditional Christian schools, not homeschoolers. I have never varied much from what we did in the beginning. What kinds of animals do you have on your farm? A pony by any chance? We live on a 6 ½ acres of land; pasture, woods, orchard and gardens. Currently we have one dog; two cats; ten laying hens; and a few weeks ago we had 80+ meat chickens, but they are in our freezer now. In the past we have had a cow and several dairy goats. We hope to have goats again soon. The milk is wonderful! Even though I am not an “animal person,” I really want a Shetland pony. The Lucky Pony Winner children have convinced me! Have you been able to follow up on any of the letters from the Pony Club giveaway, to talk to the winners or descendants? I have estimated that The Lucky Pony Winners that are included in my book were born between 1895-1910, so I do not expect to find that any of them are still alive. However, I have been able to uncover some very interesting information about the children as they grew to be adults. I plan to add this information to my website every Monday. 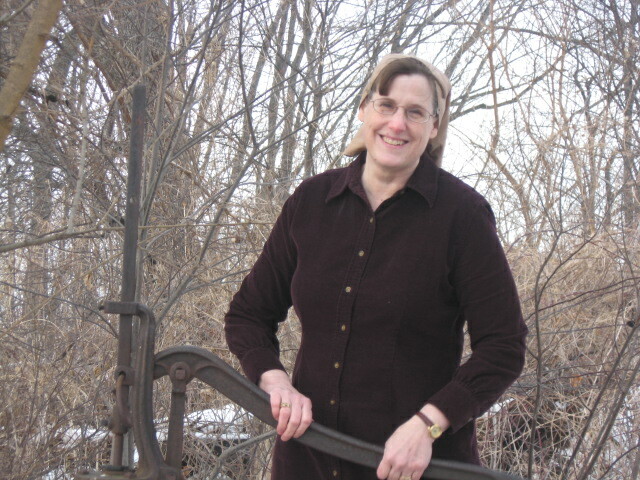 http://www.thefarmerswifequilt.com I have also been in contact with a daughter-in-law of one of the winners. I have researched less than 10% of the children so there is much still to learn. Any plans in the works for another sampler book? I do have ideas for more books, but only time will tell if they ever materialize. What method of quilting do you prefer? I much prefer to trace and cut out my templates with scissors, and sew by hand. Do you have a history of what became of the Webb Publishing Company? The Webb Publishing Company and particularly Edward, the publisher, has fascinated me. My research shows that he was a godly Christian man who was very concerned that his publications were operated on the highest standards of honesty and integrity. His obituary is briefly announced in a 1916 issue of The Farmer's Wife magazine. It stated that after his family was financially cared for, the remainder of his wealth was given to a Missionary Society. The publishing successors to Edward Webb continued his good reputation and high standing. The magazine ended when it was sold to The Farm Journal in 1939. The Webb Publishing Company was sold in the early 1980s to a non-publishing company. The Webb Publishing buildings in St. Paul, Minnesota, that are shown on page 145 of The Pony Club Quilt book are unfortunately, no longer standing. Tea! I am violently allergic to coffee!